The feedstock characteristics of the conversion platform will influence the optimal harvest and post harvest management practices for switchgrass. However, many of the harvest management practices are tied to plant phenology and will be similar across platforms. Proper harvest and storage of switchgrass will help provide a consistent and high-quality feedstock to the biorefinery. Bioenergy-specific switchgrass strains are high-yielding and in most cases can be harvested and baled with commercially available haying equipment. Many options are available for packaging switchgrass for storage and transportation, but large round bales or large rectangular bales are the most readily available and are in use on farms. Large round bales tend to have less storage losses than large rectangular bales when stored outside, but rectangular bales tend to be easier to handle and load a truck for transport without road width restrictions. 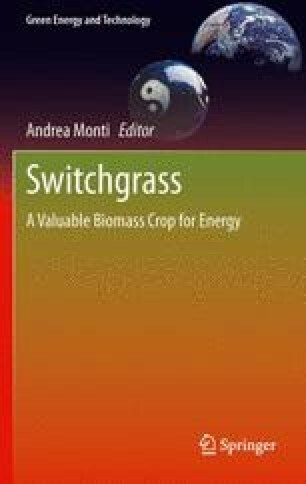 Although there is limited large-scale experience with harvesting and storing switchgrass for bioenergy, extensive research, as well as a history of harvesting hay crops for livestock in many agroecoregions, makes harvesting and preserving switchgrass for bioenergy feasible at the landscape scale.